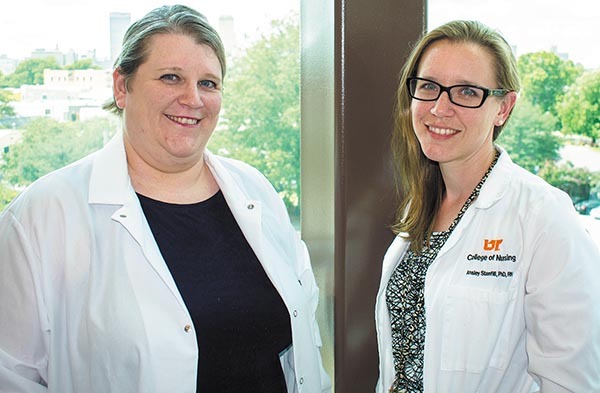 Ansley Grimes Stanfill, left, and Claire Simpson, an assistant professor at UTHSC. Ansley Grimes Stanfill, PhD, RN, assistant professor in the Department of Advanced Practice and Doctoral Studies at the University of Tennessee Health Science Center, has been awarded a $1.1 million grant to study how social, clinical, and genetic factors affect one's risk for developing severe disability after subarachnoid hemorrhage, aiming to also give insight into the disparities for this outcome seen between Caucasian and African- American patients. "African Americans are disproportionately affected by aSAH, are affected at a younger age (often under 40 years old), and are at greater risk for severe disability compared to Caucasians," Stanfill said. With a background as a bedside critical care, neurology, and neurosurgery nurse and guided by strong pilot data, Stanfill and her research team aim to develop a multivariate model encompassing social, clinical, and genetic factors which they hypothesize will provide a sensitive and specific prediction of 12-month disability outcomes for Caucasians and African Americans. They are also looking to evaluate whether, and to what degree, racial differences influence the prediction of outcomes. Stanfill says the work will have a "significant impact because it is expected to advance and expand our understanding of possible factors related to long-term disability and the disparate outcomes seen in these two races. Lack of such knowledge hinders the development of critically needed individualized and multidimensional intervention approaches to reduce post-stroke disability and improve outcomes."